For pretty much every holiday, friends and family members buy me baking supplies. Cupcake liners, baking pans, and exotic ingredients. This Christmas, my brother and sister-in-law got me some dulce sal gema. Basically, it's sea salt and raw cane sugar. It comes from Hawaii. I've been trying to find an opportunity to use it, and I thought it would taste great sprinkled atop dark chocolate muffins. I used dutch process cocoa powder to make the muffins darker than regular chocolate. This recipe is tweaked from Call Me Cupcake. 1. Preheat oven to 400 degrees fahrenheit. Line a muffin tin with 12 papers. 2. 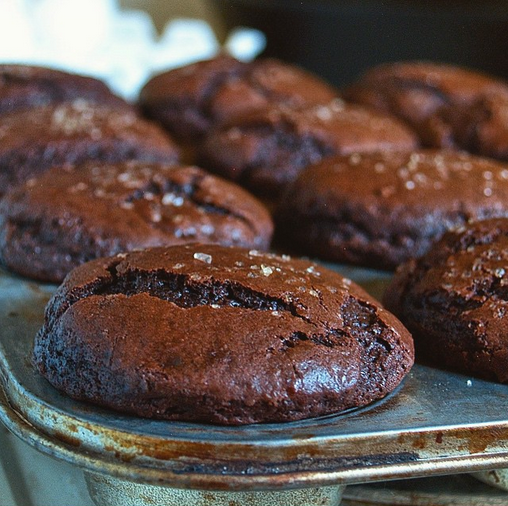 Combine flour, cocoa powder, baking powder, baking soda, and sea salt in a medium bowl. 3. In a large bowl, combine sugar, butter, buttermilk, and eggs. Beat until combined. Slowly add dry ingredients and mix until combined. 4. Add dark chocolate and mix. Scoop into muffin cups and sprinkle with sea salt. Bake 18-21 minutes, or until toothpick comes out clean.